When Steve’s car broke down, he had it towed to a city repair shop. He was thankful when the work was done, and he could get his car. But when he showed up in the pouring rain, he realized the parking lot also doubled as a parking area for the local sports games. This made it impossible to get his car out of the parking space. He was surrounded by forty other cars and would need a stream of people to help. Frustrated and wet from the downpour, Steve started cussing at the top of his lungs. He stormed over to the repair shop and tried to open the doors only to find them locked, as it was closing time. The last three store employees saw his tirade and laughed. This added to his fury, and he stormed off in a huff. When an employee unlocked the door for him, Steve came in and humbly apologized. They appreciated his apology so much that they went to work, getting his car free so he could leave. We can’t control what others do, but we can control our responses. 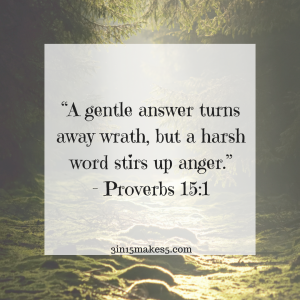 When things don’t go your way, do you respond with curse words and angry rants or do you keep your words gentle and sweet? Lord, help me to speak gracious words. I want gentle answers to be on my lips. Show me how to be meek like Jesus was. In Jesus’ name, Amen.